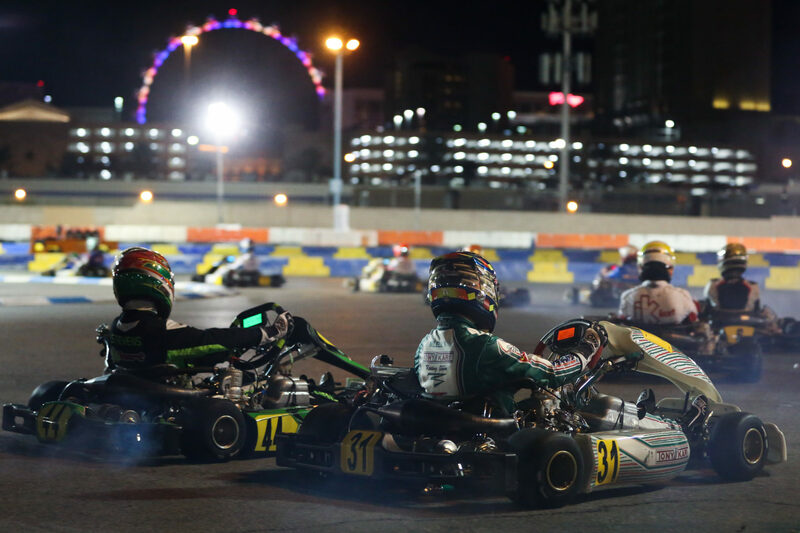 With all the starting grids settled on Thursday, it was time for competition this Friday at the SKUSA SuperNationals of Las Vegas with the first two Qualifying Heats (out of three) on the way to the “SuperSunday”. Split into two groups, one for the morning and one for the afternoon, the ten categories went through a total of 28 races but we are still to wait for the third and last Heat on Saturday to have a clearer view on each class’s final grid. , Las Vegas, 19 November 2018. SKUSA Supernational, © 2018, Alexandros Vernardis / The RaceBox. Starting on the front row of the grid, the Swede Noah Milell (main picture above, right) was able to contain the pole-sitter Marijn Kremers behind him, the two finishing in that order, split by 1.3 seconds. Starting fifth on the grid, Germany’s Maximilian Paul made it to the third spot in front of Mathias Ramirez, P4, and Leonardo Lorandi, P5 after recovering from P13 on the grid. Third-fastest in qualifying, Italy’s Paolo De Conto was hit by bad luck and forced to retire two laps from the chequered flag. An initial deception turned around in the following Heat when the CRG driver and Kremers fought hard for the win finally grabbed by the latter for a mere 0.052 second-gap! Noah Milell made it home in third ahead of Mathias Ramirez and Kyle Wick. Kart Republic’s leading man Lorenzo Travisanutto claimed his first win of the weekend in his first heat (A-D) defeating by only 0.151 seconds Thursday’s overall pole-sitter Cedrik Lupien. For his first appearance at the SuperNationals, Spain’s Pedro Hiltbrand made it to P3 while four hundreds of a second split Samuel Lupien, fourth, from Zachary Claman, fifth. The following qualifying race, opposing B and C groups, was easily won by Christian Brooks, who escaped from the second row on the grid to win with a clear 1.388 second-margin over the pole-sitter Matheus Morgatto who had to keep Joshua Car at bay in the third position. Missing the top 3 were Marco Maestranzi and Ben Cooper. Cedrik Lupien got back on his feet in the A-C race in front of his brother Samuel to make it a nicely-done family 1-2. Brandon Jarsocrak made it home in P3 ahead of David Sera and Pedro Hiltbrand. In the B vs. D race, Christian Brooks won his battle against Lorenzo Travisanutto to make it double. Matheus Morgatto finished in third with Ben Cooper and Marco Maestranzi closing up the top 5. In the Junior class, the first heat of the day (A vs. D) was claimed by Tylor Gonzalez in front of Italy’s Gabriele Mini’ and Jack Crawford, both split by less than two tenths of a second. Kas Haverkort missed out the top 3 while overall pole-sitter Tymoteusz Kucharczyk lost some ground to finish P9. The B-C race saw the victory of Jeremy Fairbairn with pole-sitter Connor Zilisch and Lucas Mars crossing the finish line respectively in second and third positions. The following round of Heat was even more successful for Jak Crawford who took the A-C race ahead of Thomas Nepveu, a good recovery result for the Canadian who had to retire in his first heat, and Connor Zilisch claiming his second top 3-finish in a row. Tymoteusz Kucharczyk once again finished P9. Lucas Mars went on to win the B-D race edged for 0.124 seconds by pole sitter John Burke and first heat’s winner Tyler Gonzalez completing the podium. In the second gearbox class, this time powered by Honda engines, the victory in Heat 1 went to pole-sitter and defending champion Billy Musgrave, 0.760 seconds clear from AJ Myers gaining one position from France’s Jérémy Iglésias. Further back, Jason Pettit completed the race in fourth place in front of Kyle Wick. Later on, Myers got his revenge by winning the second heat of the day, a good 1.125 seconds from Jason Pettit and Kyle Wick, both enjoying their first top-3 finish of the weekend. Matt Hamilton was fourth with Billy Musgrave not able to make it double with P5. Jérémy Iglesias was hit by trouble that caused him to retire early in the race. Making good use of his pole position, Rob Logan had a good day at the office in the Master Shifter category of which he won both heats on Friday morning and afternoon. In the first race, the triple-SKUSA Pro Tour S4 Master winner Jordon Musser took second place ahead of Jason Faint, Bonnier Moulton and John Crow while, in the second race, Ryan Kinnear took the second spot from Jason Faint, Jordon Musser losing two places from his first heat’s result to finish fourth in front of Mike Mantel. Kip Foster made as well the best use of his pole to claim the win in his first heat (A-D) with Jason Burns taking the second spot (+ 0.413) in front of Luis Schiavo. Jess Peterson ended up with the fourth position followed by Bruno Martins. Renato David won the next race (B-C) with Matt Johnson and Billy Cleavelin as his closest rivals. Further back were Darin Marcus in fourth and Derek Wang in fifth. Boosted by his early win, Kip Foster put up in gear to dominate his second heat of the day, winning with a comfortable 1.4-second and more margin over Billy Cleavelin and Jess Peterson. Kris Walton took the fourth spot, followed in the fifth seat by Darin Marcus. After finishing second earlier on, Matt Johnson added a win to his tally in the fourth and last race of the day (B-D) with Eric Molinatti as runner-up and Nick De Graaf in third place. Scott Roberts concluded his day with the fourth position ahead of Gustavo Carreira. From fifth on the grid, Josh Hotz proclaimed himself first race winner in the KA100 Senior class in the 21-year history of the SKUSA SuperNationals, the Americain driver winning with 0.295 seconds advantage over Dakota Pesek and Oscar Priest completing the top 3. Austin Osborne made it to the flag in fourth with Scott Foster while pole-sitter Colton Ramsey dropped further back in P11 despite stating on the front row. Dakota Pesek got the upper hand in the Heat 2 over Josh Hotz, already consolidating on his first win. Colton Ramsey recovered from his earlier troubles to cross the line in third followed by Scott Foster and Nick Ramirez. James Wharton put himself in the winner’s position at the end of the 12-lap first heat in the KA100 Junior class. The Australian kept Kaden Wharff behind him while Dylan Christie made it to the top 3 in front of Bryson Morris and Connor Zilisch, also to be seen in the X30 Junior, and pole-sitter Lucas Mars only sixth. In the second run, Mars pulled away to win by 1.766 seconds over James Wharton, edged once again by Dylan Christie. Coady Gorringe finished fourth and Connor Zilisch fifth. Jack Jeffers was the first of the Mini drivers to score a win on Friday in the heat race opposing groups A and D. Nikita Johnson came home in the second position in front of overall pole-sitter Carson Morgan, Freddie Slater and Brandon Carr completing the top 5. The B vs. C race that followed was won by William Macintyre with Mathias Coito arriving second and Kai Sorensen third. Three hundreds of a second too short for the podium, Brent Crews had to make do with the fourth place ahead of the 2017 SKUSA Pro Tour Micro Swift champion Elliot Cox. Showing a good pace, Jack Jeffers went double in the Heat 2 with Carson Morgan gaining one position as well as for Brent Crews in third. Nikita Johnson was fourth and Jeremy Fletcher fifth. Finally, Jamaica’s Alex Powell clinched victory in the last heat (B-D) by just 0.088 seconds over Kai Sorensen. Aden Rudolph was not far behind (+0.244) with Jace Park and Mathias Coito following in fourth and fifth places. Jay Urwin was proclaimed the first winner of the weekend amongst the youngest drivers on track. He won the Heat 1 with less than one-tenth of a second over SKUSA Pro Tour winner Max Garcia, followed by Ben Maier, Ethan Ayars and Cameron Brinkman. For the second qualifying race in the class, Max Garcia didn’t miss it out to cross the line as the victor in front of overall pole-sitter Tristan Young, only P10 in his first race, and Ethan Ayars. Jay Urwin was only fourth with Ivanna Richards in fifth. Click here to find the full Qualifying Heats results from Friday. The “SuperSunday” of the SKUSA SuperNationals XXII, held in Las Vegas between Nov. 14th and Nov. 18th, will kick-off this Sunday from 8:00 am local time with the first Final starting at 10:45 am (19:45 central European time). Click here to find the complete event’s schedule. All results, information and Live timing are to be found on the “Race Hero” online and mobile App, SKUSA Official App and “Mylaps” App available via this link.